Please note that this tutorial applies to the Nokia Lumia line only. It cannot be applied to HTC or Samsung phones. 1. Install the Transfer my Data app from the Nokia collection in the Store if you do not have it on your Windows Phone 8 device. 2. Launch the app from the list. 3. 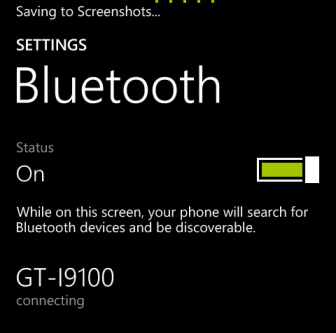 Turn on Bluetooth on both phones (Windows Phone 8 and Android), and then pair them together. 4. When the two devices are paired, a new Phone book request message shows up on the Android phone. Tap OK to allow. 5. Back to the Windows phone device, the app will show all the contacts that it can find. Tap the copy button at the bottom of the app to process. 6. You will then be redirected to the process page which shows you the time remaining and how many contacts have been transferred. 7. When it is done, you will see a message like the one below. Just tap the Finish button to exit. 8. Go to the People app to access all your copied contacts.